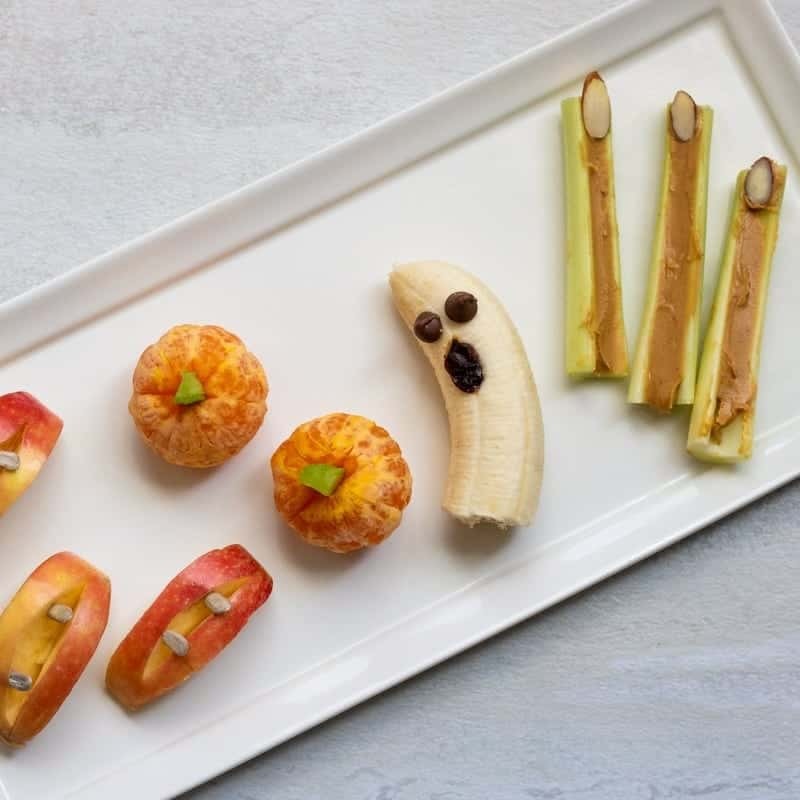 Healthy Halloween Treats: Skip the candy, and make these 4 healthy, festive Halloween snacks made with fruits and vegetables instead. My favorite thing about Halloween has to be the food! And while I do have a sweet tooth and can’t resist Peanut Butter Cups, I love making healthier Halloween Recipes as well. 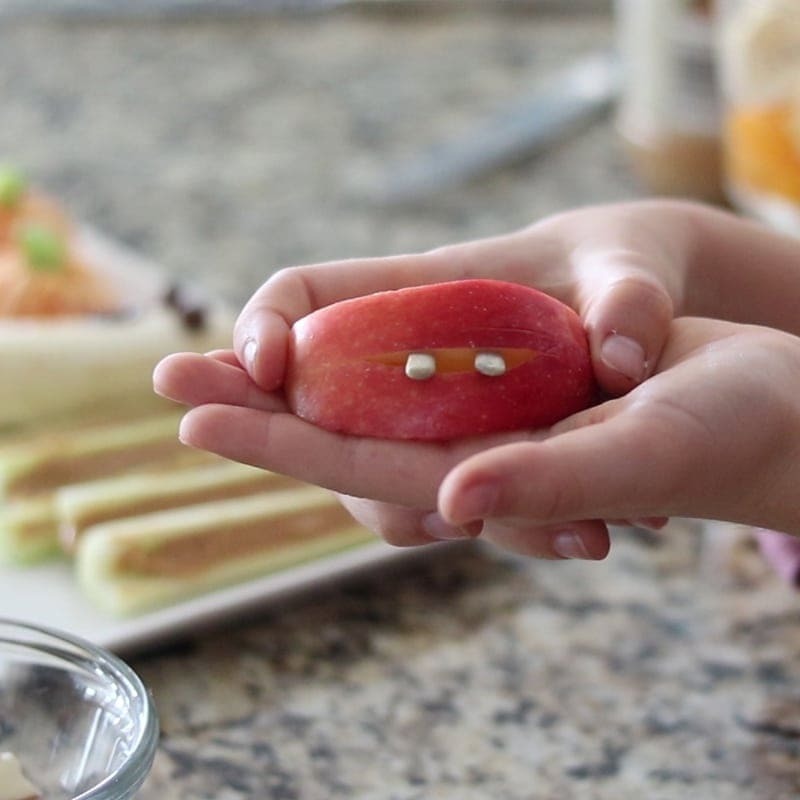 With fruits and vegetables, I have created 4 simple recipes that are sure to bring a smile to your child’s face! And what is better than kids getting excited to eat produce? 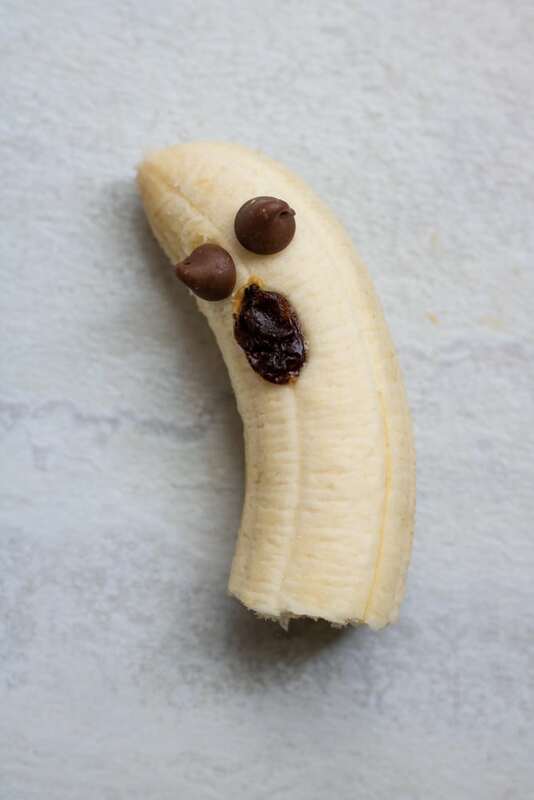 With a banana, chocolate chips and raisins, you can create this Adorable Banana Ghost. Divide a banana in half. Place two chocolate chips for eyes on ghost. Use a raisin for ghost’s mouth. 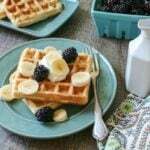 You can use nut butter to help secure chocolate chips and raisins to banana, but not necessary. An apple and sunflower seeds is all you need to make these Vampire Apple Chompers. Cut a red apple into wedges. Using a pairing knife, carefully cut an opening out of the apple (skin side up), being sure to not cut the apple completely through. Place two sunflower seeds into the flesh of the apple for the Vampire Fangs. 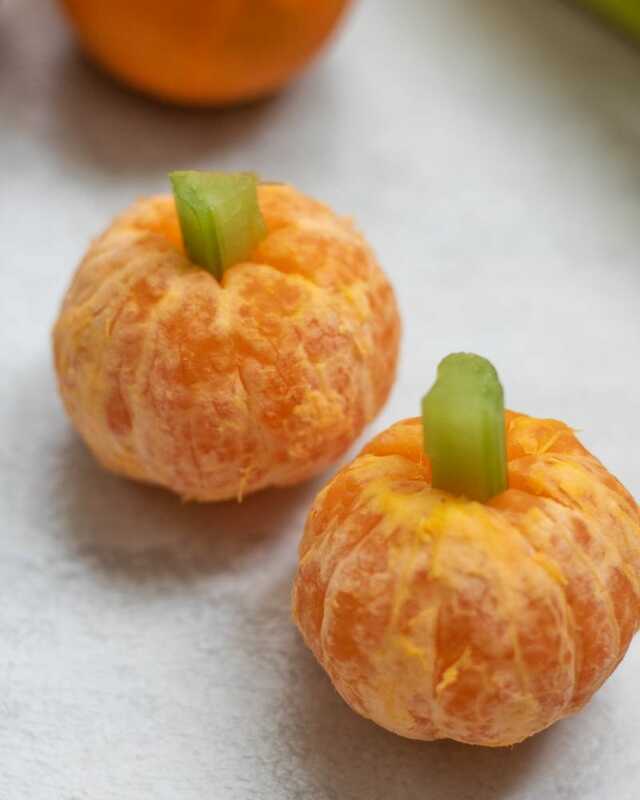 With just mandarin oranges and celery, these cute pumpkins look incredibly realistic and are irresistible for kids. Cut celery stick into small 1/2 inch sections. Place celery stick into orange. Instead of raisins and peanut butter on celery sticks to create ants on a log, use celery and peanut butter and a sliced almond, to replicate a witches finger. Cut celery into 3-4 inch slices. 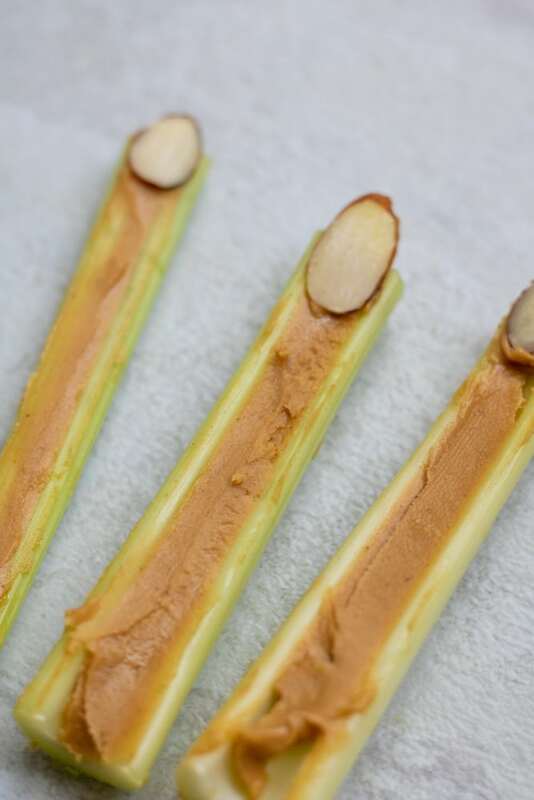 Spread the inside of the celery stick with peanut butter or almond butter. Place an almond slice on the top of the celery stick, using nut better to hold in place. So cute and creative! Thanks for sharing. Thanks Vanessa. Sometimes simple things are the best things! Those bloody chompers are so fun! I need to pin those to my Halloween board. These look so fun and creative, especially the bloody chompers! Visiting from Foodie Friday, thanks for sharing! What a great collection of Halloween Eats! Hope you are having a great fall day and thanks so much for sharing this awesome post with Full Plate Thursday. What fun and delectable Halloween treats! 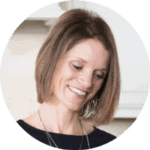 Thank you so much for sharing these healthy and delicious Halloween eats at the Healthy, Happy, Green and Natural Party Blog Hop. I appreciate it! Such cute ideas Kristen. Love the simplicity. Your kids must’ve been grinning from ear to ear. Have a great week ahead, friend! I love that these are nutritious snacks for Halloween – that can be hard to find sometimes! I just featured these recipes on my Halloween Foods roundup on my blog! YAY!!! 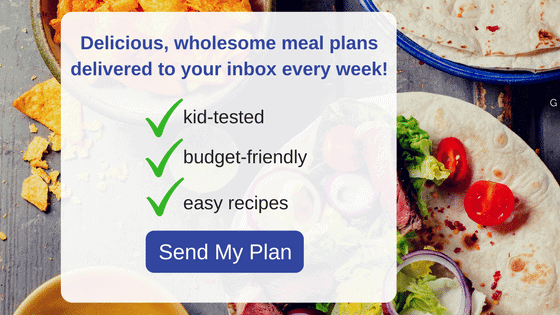 I am so glad you found these recipes! I love making fun (yet, nutritious) treats for the holidays.